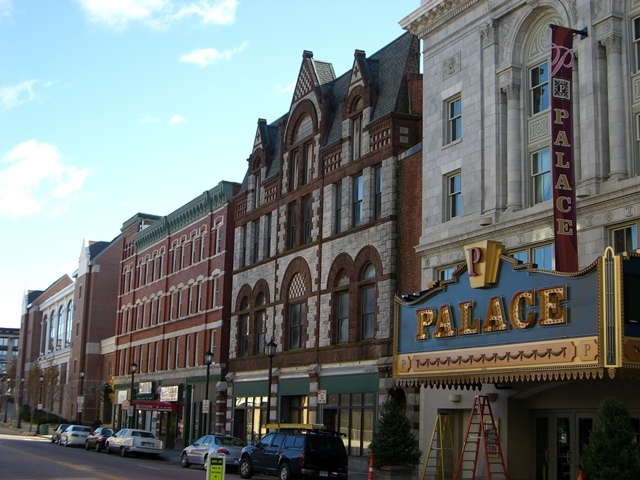 Waterbury is an old town, by any measure. When the first English settlers arrived in 1674 it was to find a well-appointed village of Native Americans. The settlers were obliged to leave the area in 1675 because certain tribes had entered a conflict with the settlers and their Native American allies, but once peace was restored they returned to the area in 1677. In the nineteenth century the city became an industrial center leading the world in the production of brass and copper. The Mad River and the Naugatuck River furnished the power to run factories that demanded so many hands that immigrants came from all over the world to work there. The city became incorporated in 1853. Waterbury was also the birthplace of the “one-dollar watch” which rendered the town’s clock industry as vital as its brass production. In fact in 1901 the Waterbury Clock Company received a letter from Mark Twain that read, “Please send me a watch. $1 enclosed.” The company evolved to become Timex in 1969. The population was last estimated to be 108,272. Annual median household income and per capita incomes are less than the national average, and the percentage of people living in poverty is twice the national average. The unemployment rate in Waterbury is 6.6 (the national average at this time is 4.1). The percentage of people who’ve finished high school and who’ve been granted bachelor’s degrees is also lower than in the rest of the country. One could infer that the fact that the economy is on the lower end of the economy and education spectrums might be reason for the fact that it’s a HIDTA (a high-density drug trafficking area), which puts it in line for federal assistance in fighting drug crime. But situations like this always have a host of contributing factors that work together to create the problem, one that requires a network of solutions to reverse. Recidivism related to addiction is a big problem here. Dealers and other criminals are arrested, released, and shortly thereafter rearrested as they commit crimes to fuel their addictions. Recently the city has seen more automobile thefts and car break-ins, a trend believed to be related to the efforts of addicts to satisfy their cravings by making money any way they can. The resources don’t appear to be sufficient to help the community address the addiction epidemic, and upcoming funding cuts forecast a dark future. Addiction does seem to be fueling the slow rise in crime, but the city is sometimes at a loss as to how to respond. Even those who seek help often have to wait prohibitively long periods just to get a bed in a rehab center. Waterbury police are encouraging citizens to work with them to report crimes as soon as they happen. The police also say that when head dealers are locked away crime declines soon afterwards, and so overdose sites are now viewed as crime scenes so that evidence can be gathered to lead detectives back to the source of the deadly drug. Social workers are being now paired with social workers to get them help with their drug dependencies. Last year in Connecticut more than 1000 people died from drug overdoses, nearly three times the number of deaths recorded in 2012, with the deadly painkiller fentanyl leading the pack of the drugs held responsible for the fatalities. For the first time fentanyl-caused deaths were higher than the number of deaths due to heroin overdose. The epidemic is effecting people of all classes, ethnic groups, and locations. The state government has decided to tackle the problem with addiction prevention, aiding the recovery of those addicted, and reducing the number of overdose deaths. Their strategy includes a public opioid awareness campaign, decreasing the availability of prescription painkillers, and increasing the accessibility of the drug naloxone (or narcan) that can reverse the deadly effects of an overdose. Senator Richard Blumenthal has pointed out that although the president announced an epidemic of opioid addiction he has only allocated $60 million to Connecticut to deal with the problem for two years. Blumenthal points out that such an amount can only scratch the surface of the needs they’re trying to address in treatment and prevention. At the same time cuts to Medicaid, the largest source of funding for drug treatment render the picture even scarier. It appears that the synthetic opioid fentanyl, many times stronger than heroin and morphine, is not only being mixed with heroin, as has been happening for years, but is now being mixed with cocaine and even with prescription medications (dealers are buying pill presses to create pills that look like the popular prescription painkillers). If the user is lucky enough to survive the use of fentanyl they have another problem on their hands: recovering from addiction to this drug is a lot harder than recovering from heroin and cocaine. Many get started on the road to addiction because their doctors prescribed painkillers for longer periods than necessary. One study shows that 80 percent of heroin users began their addictions with prescription painkillers. New guidelines for opioid prescriptions urge physicians to seek all other forms of pain reduction before turning to opioids and if the opioids are deemed necessary to only give prescriptions for limited periods. So far the program appears to be working in reducing the number of opioid prescriptions given out, which is lower than it was a year before and now also lower than the national average. Dr. Gregory Shangold of Windham Hospital and co-chair of the opioid task force says that 80 percent of emergency department visits are for pain but that patients need to stop expecting to be rendered pain-free and doctors need to stop feeling legally obligated to help them get there. Other alternatives for pain relief need to be explored in depth in order to keep perpetuating the problem. This month (April 2018) the Connecticut legislature has for the first time released a recreational marijuana bill for consideration by the General Assembly. The bill asks that state agencies come together to discuss the possible ramifications of the legalization of recreational marijuana and ways to regulate its sales. The bill also recommends programs to support addiction treatment, prevention, and public awareness. The topic is still a controversial one in this state, from a social and also an economic perspective. Setting up the regulatory committee alone would bring a cost of close to $15 million at a time when the state needs funds to battle the opioid crisis. Possession of small amounts (less than a half an ounce of marijuana) is no longer a criminal offense in the state, but is still considered an infraction and can be punished by a fine of $150 the first time you’re caught. If you plead guilty the infraction will be registered on your driving record and your license will be suspended for 60 days. Connecticut is strict about narcotics possession. Long jail terms and stiff fines await those who get caught with drugs, and the law is even harsher on those perceived to have intent to sell (which can be established on the basis of quantity or even the presence of packaging materials and paraphernalia) even if it’s a first offense. Marijuana possession isn’t judged as harshly as possession of harder drugs, but can still bring on heavy penalties. Harsh punishments alone aren’t enough to deter addicts from buying drugs and even selling them to support their own habits, which is why addiction is seen as being a critical legal defense. In Connecticut the penalty for a first offense possession of narcotics with intent to sell is up to 15 years in jail and a $50,000 fine, and the penalty is twice that period and amount for a second conviction. Sellers of harder drugs and hallucinogens deemed to not be addicted can face life sentences. When there are large amounts of drug in possession with intent to sell and distribute the drugs in other states, the United States Drug Enforcement Administration (DEA) and Federal Bureau of Investigation (FBI) can be called in, bringing with them even tougher punishments than what Connecticut doles out. What’s Waterbury doing to combat the drug problem? As mentioned earlier, Waterbury and state police have recognized that removing certain dealers from the streets does result in an immediate drop in crime rates, and so state, regional, and federal agents get involved when drug commerce spills into other parts of the country. The arrest of 25-year-old Andre Reed of Waterbury this month came as the result of criminal investigations that began with overdose emergencies, tracing the fatal dose back to the person from which it was purchased. While investigating two overdose fatalities and two overdose near fatalities which all took place in 2016 police were able to find the source of the opioid. In all three cases police found evidence indicating that the patient’s condition was due to opioid overdose, and so the area was considered a crime scene and evidence was gathered to investigate the source of the drug. After tracing it back to Reed, the seller was charged with possession with intent to distribute and distribution of heroin, as well as conspiracy to distribute heroin. If found guilty for either charge he could face up to 20 years in prison. In October of 2017 a murder took place in broad daylight at a controversial APT Foundation methadone clinic on Congress Avenue. Police as well as parents of young children who attend a nearby school had long expressed concern regarding the large number of recovering opioid addicts who regularly gathered outside the clinic and the larger than normal number of homeless individuals camping out on the Green. But those who use the clinic often credit it for saving their lives. Waterbury is one of a group of Connecticut cities that has filed a lawsuit against several large pharmaceutical companies, including Purdue Pharma, , Johnson & Johnson, Endo Health Solutions, and Teva Pharmaceuticals USA, accusing them of creating the opioid addiction and overdose epidemic. The city is seeking monetary damages for the costs of opioid addiction treatment, insisting that the pharmaceutical companies were largely responsible for creating the crisis. James E. Hartley Jr., of the Waterbury law firm Drubner Hartley & Hellman, is representing Waterbury and a group of other municipalities in suing large-scale opioid manufacturers. Purdue has been accused of marketing the powerful painkillers too aggressively, exaggerating their benefits and downplaying their risks. One can’t help but hope that the lawsuit is a success, at the very least for the revenue it would bring in that could be used to deal with the current crisis. Recent cuts to funding for Connecticut’s Department of Mental Health and Addiction Services have already resulted in 68 layoffs and the closing of a number of programs addressing the needs of those with substance abuse issues. The cuts will no doubt have serious repercussions for providers of emergency and long-term services for those suffering from addiction—in a system that’s already stretched to its limit. The cuts were made to address a looming deficit in the government’s budget. A seminar put on by Waterbury’s Health, Police, and Fire Departments teaches caregivers how to safely dispose of used syringes and unwanted, unused medications. Experts note that a big part of the opioid epidemic is that many seniors have unused painkillers in their medicine cabinets, pills and syringes that are stolen and sold on the street. Even with legitimate use some seniors are overdosing by mistake, for example someone in delicate health forgetting that they’ve already taken their medication. Seniors can now ask the fire department to come and help them dispose of unused and unneeded medications and syringes. This year the Central Naugatuck Valley Regional Action Council (CNVRAC) and the United Way of Greater Waterbury are teaming up to offer the public a series of classes training citizens in how to administer the life-saving drug narcan (naloxone) in an overdose emergency. Taking the same dosages of drugs again after detox has removed the body’s tolerance to higher doses. Waterbury’s treatment resources include both public and private facilities that provide treatments directed toward the special needs of men, women, adolescents, those with a dual diagnoses of addiction plus mental health issues, the hearing impaired, those with HIV, and pregnant or port-partum women. Facilities provide long and short term inpatient and outpatient treatment. “Inpatient treatment” means long-term treatments of 30, 60, 90 days or even longer. The patient remains within the facility 24/7 and is expected to cooperate with the program and make every effort to assist in their own recovery. Holistic and other alternative treatment approaches are available in Waterbury treatment centers, and daily recreational activities are part of the program. Those entering inpatient treatment can expect the following processes. At this stage the patient’s addiction history and health are assessed by a doctor, who may also try to ascertain if there’s any history of mental health problems which would have a bearing on treatment options. A further more detailed interview may follow, but normally there is only one interview that takes less than a half hour. At this stage the patient will be admitted to the program, payment arrangements, if any, will be made, and the patient will be instructed in greater detail as to the rules of the program and what can and cannot be brought into the facility. Usually contact with the outside world is reduced to decrease the possibility of relapse triggers and opportunities to abuse drugs. The word “inpatient treatment” simply refers to care administered to a patient living in the facility, whether it be a hospital or a center providing long-term care. There are a number of facilities in New Haven that provide excellent inpatient care for varying periods of duration. Waterbury hosts a number of nonprofit outpatient treatment centers that help substance abusers get clean and that also support their ongoing sobriety. With outpatient treatment a patient can remain at home while accessing regular outpatient treatment that includes checking in regularly with individual counseling sessions and peer support sessions. Patients who are committed to recovery but who for some reason can’t enter a residential program often benefit greatly from such programs. For those who’ve relapsed before or who have more severe addictions and underlying mental health problems may benefit from an an intensive outpatient program (IOP). IOPs have a more structured approach, with more frequent meetings and regular drug tests. Partial hospitalization programs (PHPs) are also available for those who need medical observation and treatment. The recovering patient comes in for treatment and monitoring once a week. Recovery is a hard road to travel, but one with a beautiful final destination. We’ve travelled that road ourselves and love nothing better than to see another successfully reach recovery and live a new life, drug-free.